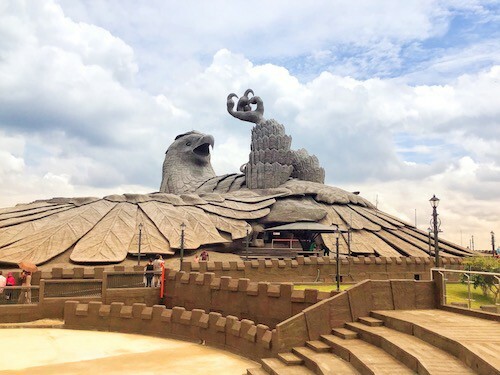 Jatayu Earth Centre – The worlds largest bird sculpture is the new attraction of India, which is in Kerala 50 kilometer from Trivandrum towards North (Cochin direction). 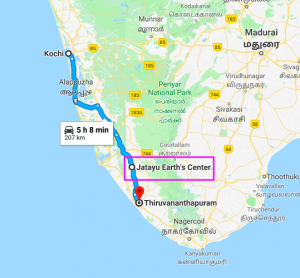 Traveling from Cochin to Trivandrum, this is 170 kilometer from Cochin, 114km from Alleppey and is 40km from Kollam. 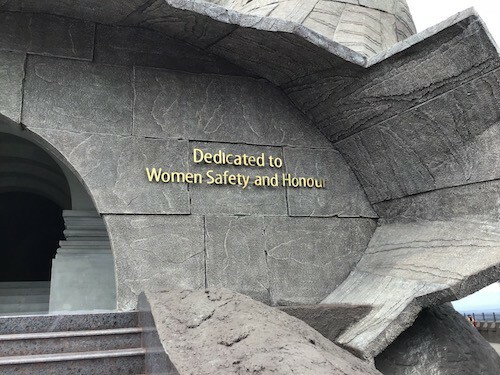 This is the masterpiece creation of Mr. Rajiv Anchal with a dedicated work of 10 years and the message being Women safety and Honour. Jatayu symbolizes an era where human and other living beings cared each other. The methodology will be written in the due course in this article at appropriate places. An ideal itinerary with Jatayu Earth center can be prepared as below during a Kerala or South India tour package. The total kilometer mentioned is for a one stretch travel but would be around 1050 including all sightseeing at all destinations. This is a must stop during a travel from Cochin to Trivandrum and is ideal for a day outing or a destination to spend a day during a Kerala tour. The destination is a combination of artistry, mythology, technology, culture, adventure, leisure and wellness put together royally the way we have never experienced. 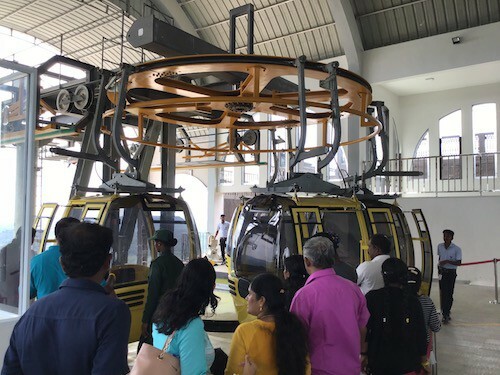 The 200 feet long, 150 feet wide and 70 feet tall sculpture is the major attraction along with ropeway and many adventurous activities make the destination ideal for families as well for adventure lovers. 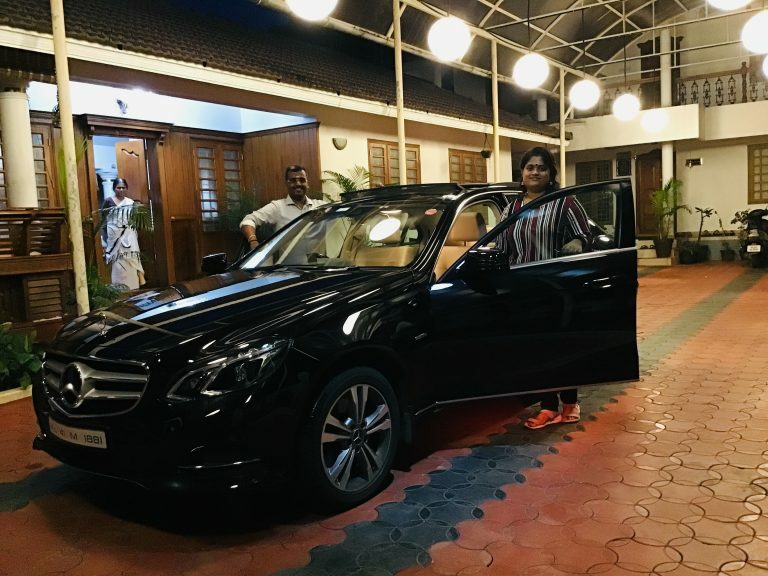 This blog is about my travel to this destination along with family, to have a real life experience so as to extend the same to all tourists travel to Kerala. We started from Aluva on 17th October 5.30AM from Aluva. We crossed Alleppey around 7 am and reached the destination by 10 am with a stop of half hour for breakfast. Alleppey to this place can take around 4 hours, we were in the less traffic time hence reached in 3 hours. 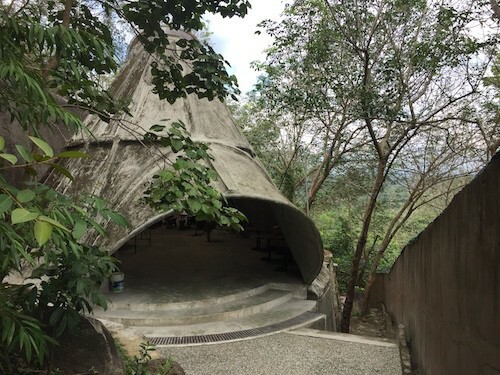 To provide an overview, the entire Jadayu Earth center has four hills. 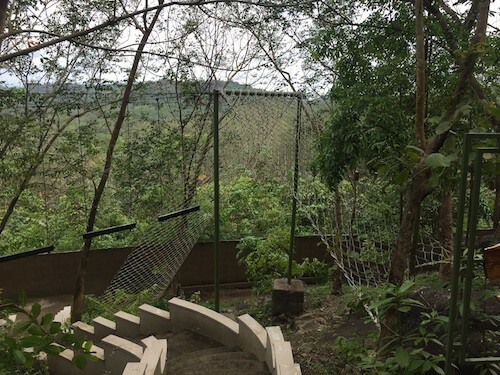 Hill 3: Aanappara in Malayalam – Elephant Rock Hill, the activities around this rock is yet to start as on date and is expected to have a zip line, sky cycling, night tent, campfire, moonlight dinner with live music, live kitchen etc. 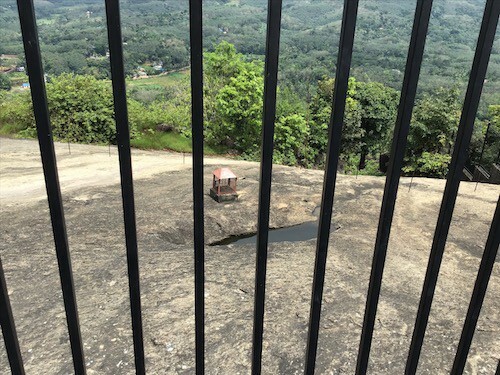 Hill 4: Adukkalappara in Malayalam – Kitchen Rock Hill, the activities in this rock is also to be started which includes Siddha rejuvenation in natural caves with accommodation and herbal garden. The helipad is made near to this hill. 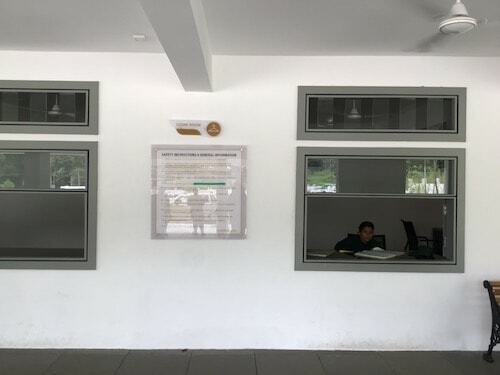 Please note there is no ticket counter to do the manual booking and only online booking is allowed with a time slot of 10 to 12, 12 to 3 and 3 to 5 where the charge is Rs. 400/- per person including rope car ride. This time slot means, we need to visit the place during this time. If we have taken a time slot of 10 to 12 – we should enter between 10 to 12. The rope care runs continuously. On entering the main gate, after parking the car we need to move to the entrance of Jatayu Earth Centre after security check. Clock room to keep your personal belongings. On entering we need to get the tag, scanned and move towards cable car. The tag of different color denoted people of different slots. Entering and the ride in cable car was a different experience The scenic beauty was really an experience which anyone enjoys. Click on below link for a video which gives a better feel. After embarking from the rope car we moved to the Sculpture. Disabled/old age people can move up steps using this chair after getting down from rope car. The sculpture is 200 feet long, 150 feet wide and 70 feet tall, making it the largest bird statue in the world with an enter into the Guinness Book of World Records. According to the mythology Jatayu is characterised as a noble bird in the epic Ramayana. While Seetha devi was being abducted to Lanka by Ravana Jatayu rushed to her rescue, stopped Ravana’s chariot named Pushpaka Vimana and engaged in a battle with Ravana. During the battle, Ravana cut off the birds left wing and went away with Sitha devi. 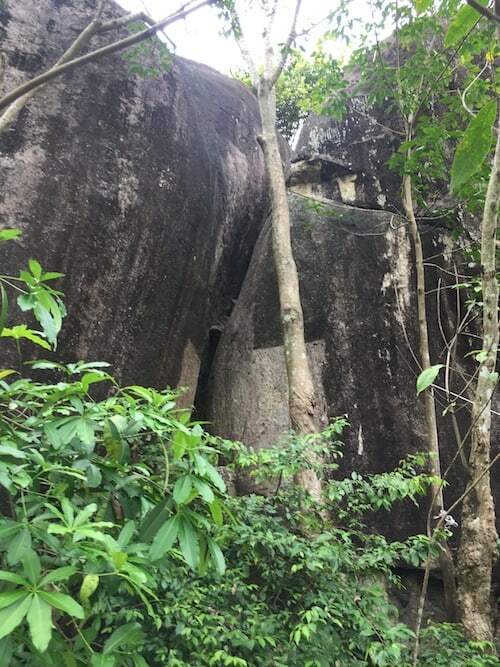 It is said that the injured Jatayu and his lost wing landed on top of this rock. 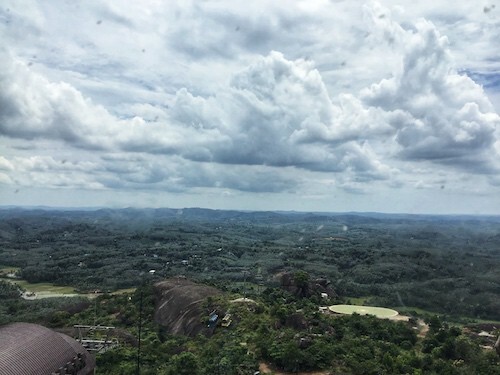 In time, the rock got the name Jatayupara (Jatayu Rock). 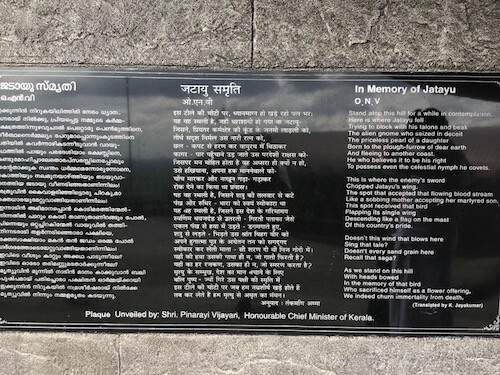 This is where the statue of Jatayu is now built. The scenic beauty from the top is mind blowing. Some pictures taken from the top. 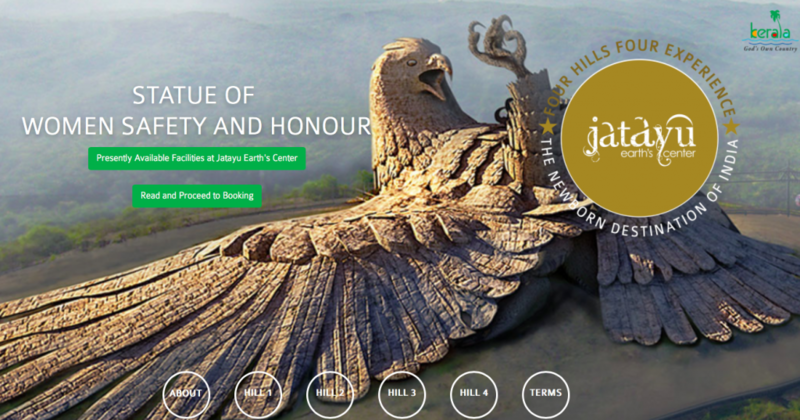 This video showcase Jatayu rock and the surrounding better. The space inside this sculpture is 15,000 sq.ft. Work is going on at this space to provide visuals which brings the actual effect of treta yugam. 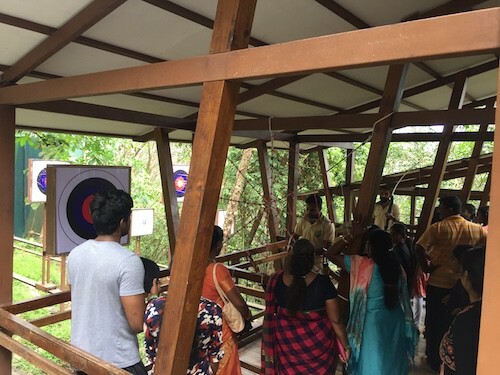 It is informed, once the work is completed the guests will be taken through this experience and will be taken to an amphi theatre, a 6D theatre which gives us the feel of Jatayu fighting with Ravana to save Seetha devi, thus by passing the audience a message to honour and respect women. 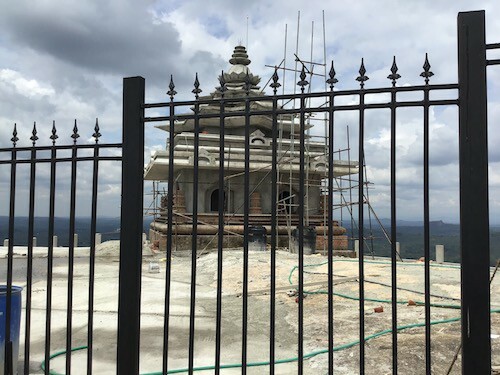 With this, we come out of the sculpture, where we enter in to a Rama temple (Currently the work is in the finishing stage so we could not enter). There is a pond near the rock which is said to be formed by the stroke of Jatayu’s beak. It has water throughout the year and never goes dry, imagine a waterbody at 1000 feet high. Below picture shows this pond. It is also said that Lord Rama later came to Jatayupara and gave moksha to the dying Jatayu. The good bird told the whole story and Rama got the vital information about his wife Sitha. There is a mark of footprint said to be that of Lord Rama. 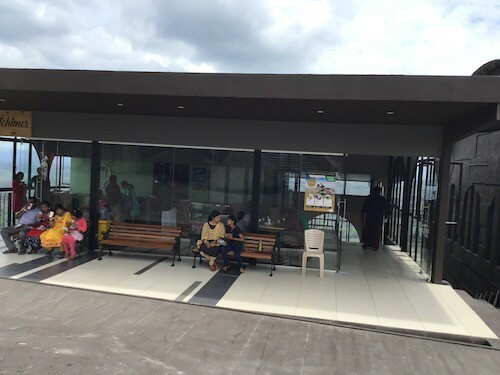 At the top, there is a small snacks counter where you can purchase soft drinks/snacks/water etc. 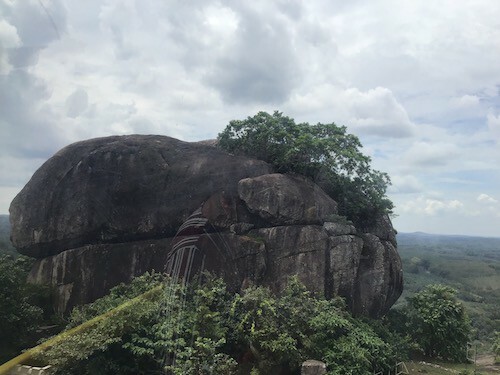 Below is the Adukkalappara – Kitchen rock Hill, the 4th hill which can be seen during the rope car ride. 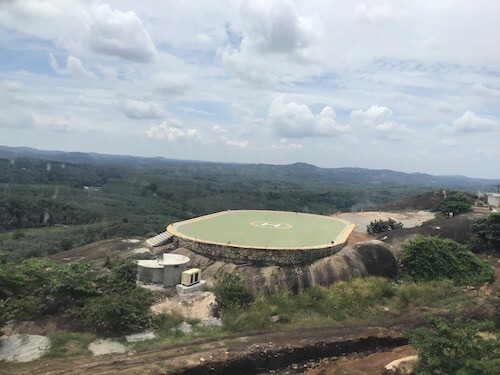 The helipad is also seen near to this hill. 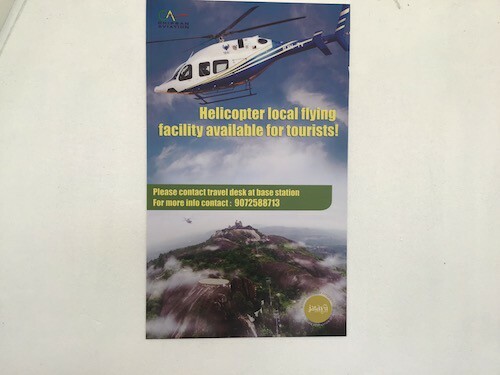 You even have the option for a helicopter ride, a round above the Jatayu sculpture which charges only Rs.2400/- per head + GST. This 8 to 10 minute ride gives an areal view of the place. 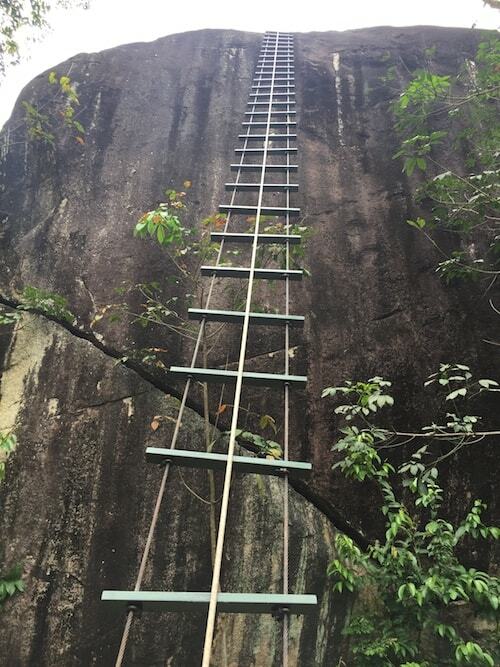 On reaching the bottom we went for lunch and post lunch to visit adventurous activities which is in the Hill 2. As on today, the rate for Adventurous activities is Rs. 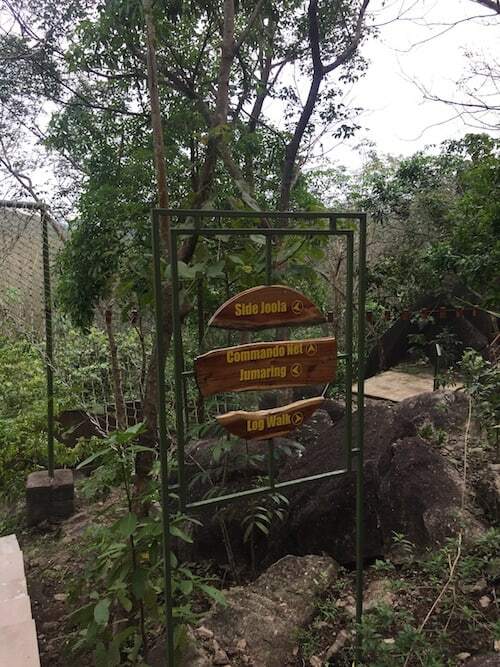 500/- per person where you can go for 15 activities at no extra cost. 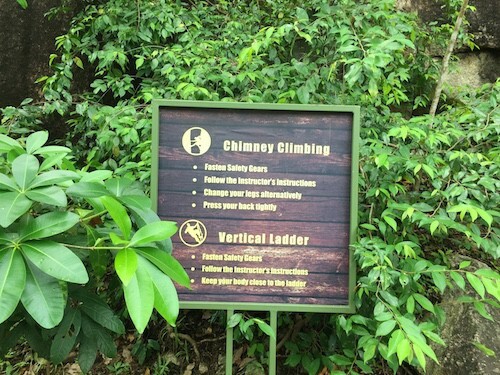 An adventurous person require one full day to enjoy and experience this. 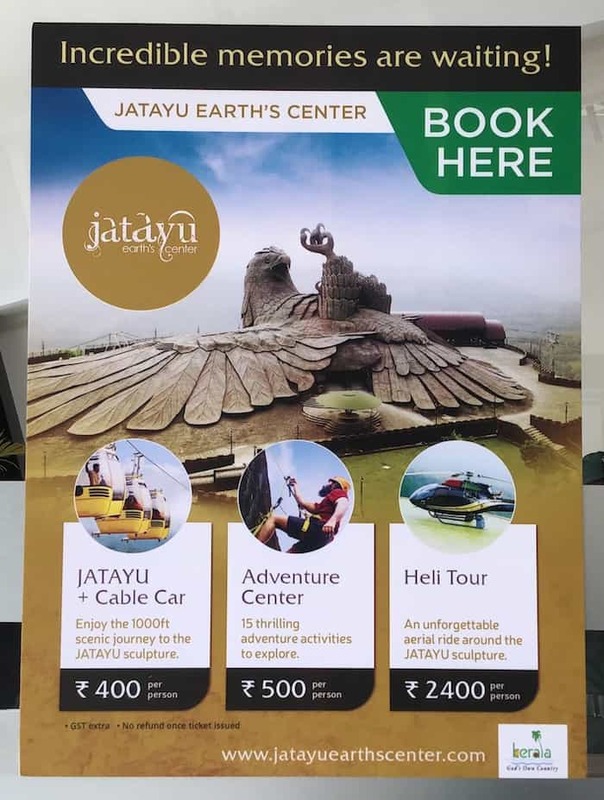 If you are on a tight schedule go only for Jatayu sculpture visit through rope car and invest a full day if you are interested in adventure centre. I just had a glance through the facilities as below. 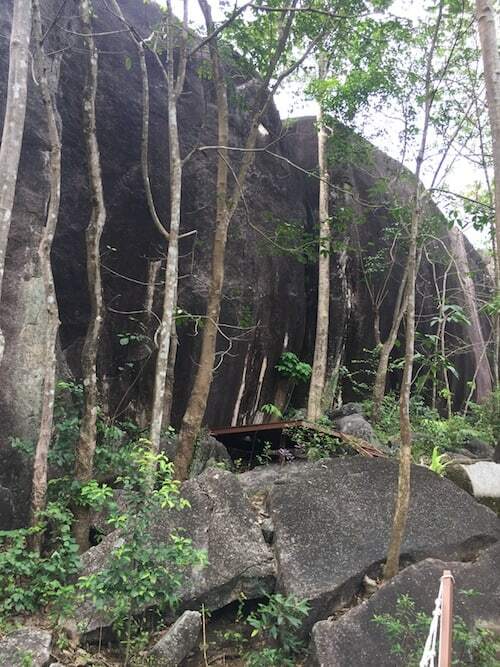 There is a walk through the natural space to reach this area which itself is a different experience. 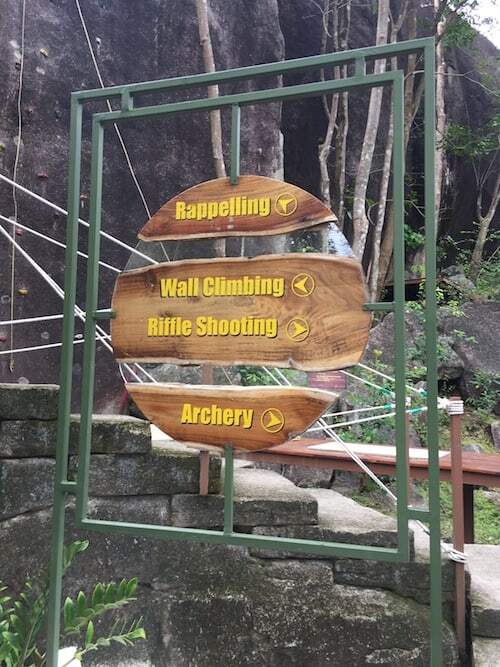 There are well trained 15 staff to guide you for all the activities. All safety measures are also being used. 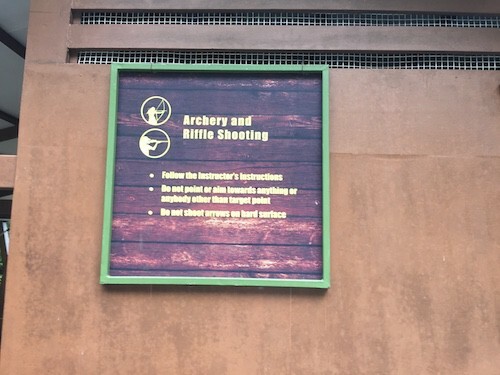 The first activity is Archery and Riffle shooting. Valley crossing, paint ball etc. are the other activities you can experience in this heaven. We came out with lot of experiences and it was one of the best destination visit I ever had. This place is the buzz of town now and is going to be one of the major tourist centre in the country. They are expecting around 4500 people visit this place per day in the coming days. I thank the centre for nice arrangements made and Mr. Manu who took us around and explained everything in detail. 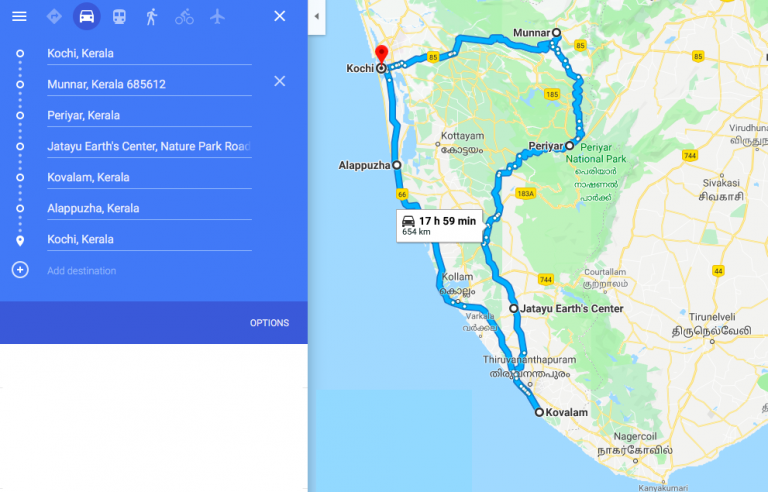 I would suggest every traveller who is on the way to Kovalam to have a must visit of this destination as well others to include this in the itinerary. This destination can also be good for a day outing or for two if you are an adventurous person. There is a descent hotel nearby for the stay too. 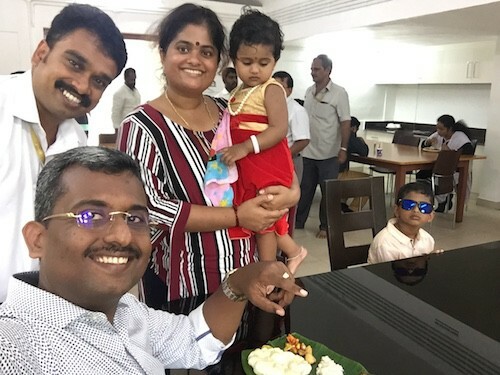 This blog is written on 18th October 2018, the rates and facilities mentioned are as on this date. Please visit https://paradise-kerala.com/blog/directors-blog/ to read more about me and other articles. Thank you and love to see your comments. If you like this pose, please share!! Awesome Blog… I visit at munnar last week. It was amazing experience with my friends.. I saw Neelakurinji flower and also the beauty of munnar which is filled with greenary that cherish our mind. That nature beauty makes our mind calm. Wonderful narration…Proud to be part of this wonderful,,sustainable Eco tourism project..In fact it was my dream to have a state of art.. world class tourism destination n my own native ..Chadayamangalam. Hats off team Jatayu and a special salute to our captain Rajiv Anchal…! !